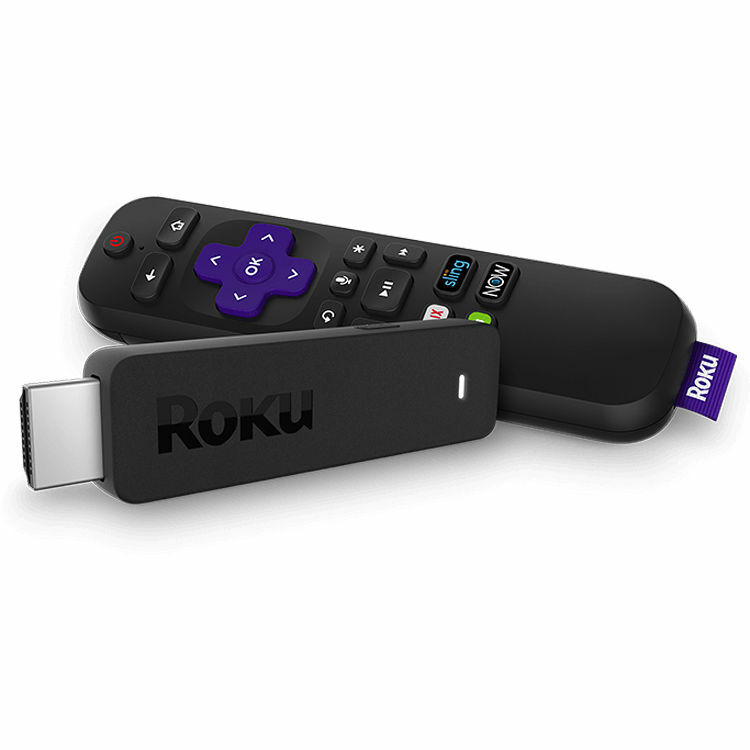 Access over 500 channels of entertainment with the Roku Streaming Stick. Its compact 0.5 x 3.3 x 0.8" design makes it suitable for attaching to wall-mounted displays. Once plugged into a display's HDMI port, the Streaming Stick will connect to the Internet via its built-in Wi-Fi connectivity and is controllable via the included remote control or an Android or iOS smart device app. It connects to your display via HDMI, supporting resolutions up to 1080p, and upscales lower-resolution content to Full HD for an enhanced viewing experience. The included voice remote lets you search for your chosen content by simply speaking to it, and allows for control of your display's power and volume. Note: Content acquired via certain apps may require subscription to a service. Not all apps or services are available in all areas. The Streaming Stick is designed to provide smooth HD streaming and quick-launching channels. You can take the Streaming Stick nearly anywhere you go; just bring the remote and power along. With the included voice remote, you can power up and change the volume on most TVs, control the Streaming Stick, and use your voice to find your favorite shows across over 500 channels. The Streaming Stick and power cord plug into the back of your TV for a clutter-free setup. Just plug it in, connect to the Internet, and start streaming. With access to movies, TV, original series, kids' shows, news, sports, and more, you can watch almost anything across over 500 free or paid channels with just a click. You can access hundreds of live-streaming and on-demand free channels, including the Roku Channel, featuring Hollywood hits. Search by title, actor, or director, and get unbiased results across over 500 channels to see where you can stream your favorite shows for free or at the lowest cost. Turn your iOS or Android device into the ultimate streaming companion. 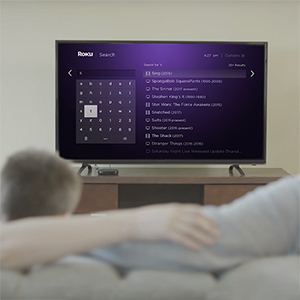 The app lets you control your Roku player or search with your keyboard. Private listening allows you to use headphones to listen as loud as you want without disturbing the house, and voice search allows you to search by title, actor, or director across over 500 channels using just your voice. The app also lets you cast to your display to enjoy your photos, videos, and music on the big screen. Box Dimensions (LxWxH) 5.4 x 5.4 x 2.2"
Streaming Stick is rated 4.5 out of 5 by 26. Rated 4 out of 5 by Debbie from A major improvement over the Sony BD Player I didn't know what I was missing by streaming over my sony BD player. The Roku is faster, with a cleaner picture, and generally easier to navigate once you switch your brain over from the other device. It seems to have very basic settings, and I sometimes wish I could do a little more customizing. Also, not sure if this is possible, but it would have been great to be able to switch the input using the remote. I do like that I can stream xfinity through Roku, so don't need to go back and forth, although it's a beta app and there are ominous messages about having to pay a fee at some point (which is the point I will stop using that feature). Overall, a happy experience, I recommend it. Rated 4 out of 5 by Matt from Good for parents I bought this gift for my parents, but I knew I wouldn't be there to set it up. Thankfully the Roku is super-simple to set up ... except that it does require a credit card even if they have no intention of buying anything. Their unwillingness to put up a credit card number halted the whole set-up. Rated 3 out of 5 by robert from Appears to be an Overheating Issue Bought this for my parents. Worked for three weeks with no problems. Roku displayed the following message: Stick is overheating, turn off device (paraphrasing). The TV room is fully air conditioned so it is doubtful the ambient temperature is contributing to the problem. Did some research and seems like a known Roku problem. Ordered the HDMI extender cable to see if this will help. Rated 4 out of 5 by mike from Very Good Product but one problem.. I previously owned what I guess is now called the Ultra. The unit was always hot but had great performance but it stopped working after 4 years. The stick I've been using for a month now, it runs cool, but sometimes it does not response for up to a minute or so when I trying to pause or fast/rewind/ forward. Otherwise it is also a solid performer. A little annoyed that there is a special now for $10 less.. Rated 5 out of 5 by Antonio from Great little thing I have had 4 different Roku and this is so far the best one. I can't imagine watching TV without Roku. Rated 5 out of 5 by Luke from Great easy to use product Great little stick. There are so many choices out there. I was looking at the Apple TV but at less then half the price you cant go wrong. The picture is great, no issues with buffering. Heaps of apps to choose from. Although I only really use Netflix and RedBull TV. and for only $20 more then a google chromecast it is fantastic to have its own standalone system. Rated 5 out of 5 by AG from Roku Rocks Added a 2nd Roku stick to my stable of Roku items (one box, 2 sticks).? Picks up signal fine and activation was simple using my smartphone as an assist. is the streaming stick 3800r quad core? Yes. It has a quad-core processor. Can I get subscription of PlayStation Vue on this stick? I don't know. It may depend on which country you reside. I'm in Australia which has very limited access Roku apps. How long is the included USB cable? Is the wifi connects to 5g??? Possible to install on the Streaming Stick from the Channels store : PrimeVideo , for which I am subscribed in Israel ? is the roku streaming stick 3800r quad core processing? Yes, the 3800r does contain a quad-core processor. Do you need wifi service or does it run off its own wifi connect? You need WI-FI for the unit to work.